In our most recent post, we took the opportunity to offer up a few tips about developing young leaders in the workplace. As you could probably guess, one of them had to do with taking the whole gang to our treetop adventure course in Raleigh, the aptly named Treetop Raleigh Adventure Park! Set a good example – practice what you preach! 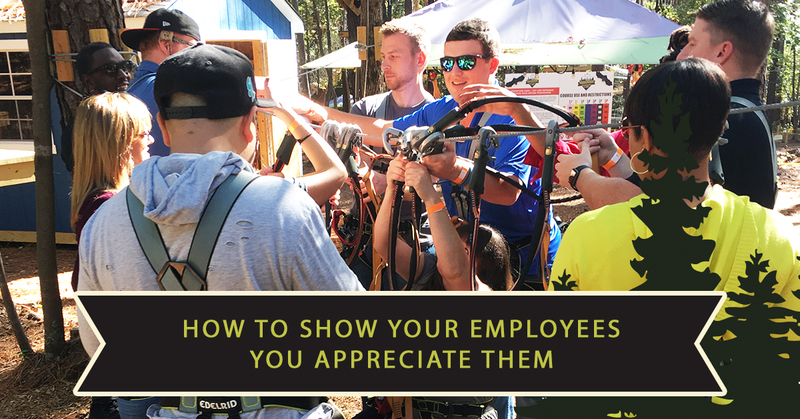 Finally, we described how you can make sure they feel valued at your company by, among other ways, taking them to our obstacle and ropes course in Raleigh. Complete with zip-lines, three different difficulty levels for every ability, and even a Junior Park for the little ones ages 4 to 7, there’s a lot to like about treating your staff to a totally unique aerial adventure! Give Your Employees The Gift Of Adventure! The above describes our thought process for today’s topic; not only is our local aerial adventure park a great opportunity to develop young leaders, it’s awesome for employees, families, and individuals looking to have a blast in the outdoors as well! While some corporate retreats can have a stale, “going through the motions kind of feel to them, we assure you that taking your crew to TreeTop Raleigh Adventure Park will be anything but mundane. In fact, it just might get the heart pumping a little bit. Your staff will be physically challenged (to the extent that they prefer, given the three different difficulty levels), and have to rely on one another to complete the obstacle courses. Best of all, it’s an absolute great time, being out in the outdoors among the trees! Learn About Them & Their Interests – Take a bit of time to get to know them and what they are passionate about. Is it family? Sports? Music? Playing computer games? Coming to their favorite local outdoor adventure park twice a week? There’s no way of knowing…unless you ask. As an employer, your legitimate interest matters. Always offer praise – If you’d like to foster a healthy working environment, take notice of a job well done. Not only should you look for good things (and not just the bad ones), you should point it out. Don’t be afraid to offer up some praise in front of others as well. Of course, you shouldn’t have any favorites, so do your best to make sure everyone gets a shout-out every now and then. Reward Them With Food! – You might not be able to give them a raise every time they do a good job (nor should you), but you can celebrate milestones and accomplishments with a special treat every now and then. Maybe it means you bring coffee and donuts in every month you reach your quota, or maybe it’s something more extravagant. Don’t break your piggy bank, because it’s the thought that counts (as long as you aren’t being genuinely cheap, of course). Create A Culture, Step By Step – You want people to enjoy what they do and where they work. You want people to enjoy the people they work with, too. The fact is, not everyone is going to be best friends, so you need to figure out a way to bring people together as much as possible. One way of doing this is via creating fun traditions and activities that people can look forward to. It breaks up the day for one thing, and for another it affords people a platform to get to know one another. Say Please & Thank You – Being considerate and polite can go a long way, as your grandparents might have taught you. It’s true — and it’s doubly important for you, the supervisor to set the standard of how your staff treat each other. They’ll model the example you set, whether they (or you) realize they are doing it or not! Boost Morale & Book Today! Now that we’ve offered up our two cents on the matter, it’s up to you to decide which of these techniques you will implement. Naturally, we’d love if you shared an aerial forest adventure with us at your next team building activity in Raleigh, but the choice is yours! Book your next corporate event, today!